A New York district court dismissed an action brought by citizens of India against the parent corporation of Union Carbide India (now Everready Industries), Union Carbide Corporation (now part of Dow Chemicals). Plaintiffs sued the parent company to clean up the contaminated site, where water supply has also been affected. The court reportedly rejected arguments on piercing the corporate veil and noted that the parent corporation was not responsible for the accident or for the clean up. News reports on the decision are available here and here. The plaintiffs will reportedly appeal the decision. UNESCO has listed twenty six new sites. The inclusion of these sites in UNESCO's list entitles them to protection and funding assistance under the World Heritage Convention (WHC). The Western Ghats is an area rich in biological diversity and its inclusion may have interesting implications in terms of action to protect WHC sites from climate change. UNESCO's resolution and recommendations on protecting world heritage sites can be found here. 1) Hydraulic fracturing has been around for a long time--indeed, for more than half a century--and is used to extract both oil and gas. In Coastal Oil v. Garza, the Texas Supreme Court suggested that fracturing has been applied commercially since 1949. Oil and gas operators have used hydraulic fracturing in a variety of formations, including tight sands, shales, and coalbeds (see the somewhat controversial EPA study of coalbed fracturing here), among other formations, and the effects of fracturing may vary substantially depending on the type of formation fractured--particularly the depth at which fracturing occurs. Although fracturing itself is not new, one type of fracturing only emerged within the last several decades and has boomed within the last ten years. "Slickwater" or "slick water" fracturing, developed in Texas's Barnett Shale in the 1990s, is "new" in several respects: It often involves the drilling of both a horizontal and vertical well, and it typically requires large volumes of water--somewhere between two and eight million gallons (or between 1.2 and 3.5, depending on the information source) for each fracture treatment--and small quantities of chemicals (about 0.5 percent by weight). 2) Many of the stages of producing oil or gas from a fractured well are identical to conventional oil and gas well development. An operator constructs an access road and well pad; drills, cases, and cements a well; and temporarily stores on site drilling wastes, including drill cuttings, used drilling mud, and produced water that comes up from the formation when drilled. The operator then disposes of this waste. Depending on the state regulation, some waste may be buried on site or applied to certain land surfaces, while other waste must be sent a landfill, disposed of in an underground injection control well permitted under the Safe Drinking Water Act, sent to a wastewater treatment plant, or disposed of through other methods approved by the state. Depending on state regulation, an operator that drills and fractures a well also completes certain site restoration after drilling and fracturing is finished, as does a conventional developer after drilling. Fracturing also requires additional processes, however, including withdrawing large quantities of water; trucking or pumping in water and storing it in a pit or tank on site or in a centralized impoundment; trucking chemicals on site and mixing them with water; perforating (punching holes in) certain portions of the well casing (although many conventional wells also are perforated); treating the shale around the wellbore with an acid to clean it; injecting water and chemicals into the well at high pressure to fracture the shale around the well and/or expand existing fractures; injecting "proppant" into the well to prop open the fractures once formed; and capturing and disposing of "flowback" water--the water and chemical mixture used for fracturing, some of which flows back up out of the well. For a detailed description of the fracturing process and its potential environmental effects, see chapter 5 of the New York DEC's preliminary revised Supplemental Generic Environmental Impact Statement for high-volume fracturing. For a report on the chemicals used in fracturing, see this House Committee on Energy and Commerce Minority Staff Report. 3) Fracturing is increasingly common. Industry estimates that more than 90 percent of gas wells in the United States are hydraulically fractured. I am not familiar with the numbers for oil, but certain shales with oil--such as the Bakken Shale--have experienced a fracturing boom. (Shale oils are not to be confused with oil shales, which must be mined to extract oil.) The rise in fracturing for natural gas has been astounding. In 2000, the Texas Railroad Commission issued 273 permits for gas drilling in the Barnett Shale. In 2008, it issued 4,145 permits, and operators received 2,157 Barnett permits in 2010. 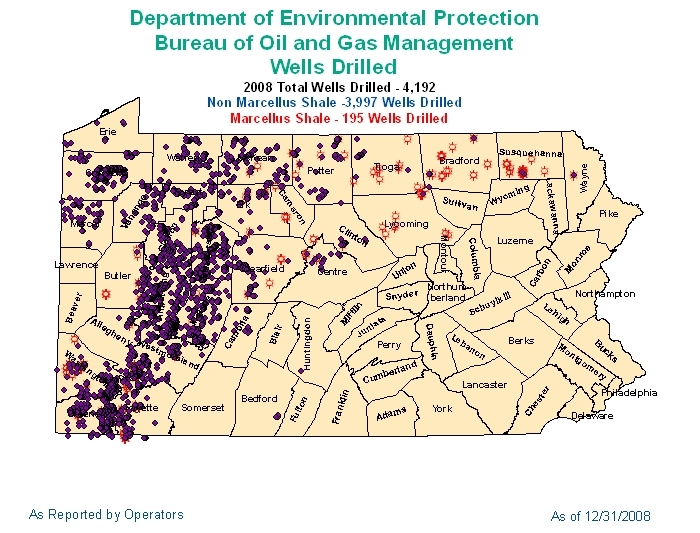 In 2008, operators drilled 195 wells in the Marcellus Shale in Pennsylvania; in 2010, they drilled 1,386 wells. The U.S. Energy Information Administration has a useful map of all shale plays and of shale gas production, much of which so far has occurred in Arkansas, Louisiana, Michigan, Oklahoma, and Texas. West Virginia's and Pennsylvania's production numbers will continue to rise, and New York will be an important player when the New York Department of Environmental Conservation finalizes the conditions that it will place on high-volume fracturing and begins to approve permits. Shale oil and tights sands formations also typically are fractured and have generated increased interest in states like Colorado, Montana, New Mexico, North Dakota, and Wyoming, among others. 4) Portions of the development process for a fractured well are federally regulated. Operators may not dispose of pollutants into navigable waters without a Clean Water Act NPDES permit, of course. They are potentially liable under the Comprehensive Environmental Response, Compensation and Liability Act for pollution caused by hazardous substances other than oil or gas, and they must maintain material safety data sheets on site for certain chemicals, as required by the Occupational Safety and Health Act and the Emergency Planning and Community Right-to-Know Act. (See this recent post summarizing disclosure and the MSDS requirement.) Operators also enjoy a number of federal exemptions, however, including exemptions of exploration and production (E&P) wastes from subtitle C of the Resources Conservation and Recovery Act (see 42 U.S.C. 6982 (m)(1), 42 U.S.C. 6921(b)(2)(B), and 53 Fed. Reg. 25,446); reporting of annual toxic chemical releases under EPCRA (see 42 U.S.C. 11023(c), which references the document with the Standard Industrial Classification codes to which the reporting requirement applies); and oil and gas pollution from CERCLA liability (42 U.S.C. 9601(14) excludes petroleum and natural gas from the definition of "hazardous substance.") For the fracturing process itself--injecting water and chemicals at high pressure down the well--an operator also is not subject to the Safe Drinking Water Act unless the operator uses diesel fuel. See 42 U.S.C. 1421(d). The EPA currently is developing UIC permitting standards for fracturing with diesel fuel. If the operator disposes of drilling or fracturing wastes in a UIC well, then SDWA applies. Operators also must comply with the Migratory Bird Treaty Act and the Endangered Species Act, and the EPA has proposed new source performance standards for VOCs from fractured and re-fractured wells under the Clean Air Act. 5) State regulations of oil and natural gas extraction--including the fracturing portion of the process--vary. All states have a variety of casing regulations that typically require casing to extend a certain number of feet below underground fresh water (or require, more generally, casing that protects water), and that the cement used to secure the casing be of a certain minimum strength. Many states require that pits used to store drilling and fracturing waste be lined, either with clay or a synthetic liner, and some, such as New York, are moving toward requiring steel tanks for waste storage. States also sometimes regulate the required minimum distance between the edge of the well pad, pits, or the well itself and various natural resources, such as streams and wetlands; others have few of these types of distance restrictions. Many states have begun to update various regulations or to issue less formal directives to address the rise of gas and/or oil development and fracturing. See, for example, West Virginia's focus on water withdrawals; Pennsylvania's updated well water replacement, cementing, and casing requirements (58 P.S. 601.208, 25 Pa. Code 78.51, 25 Pa. Code 78.83, and the Pennsylvania Bulletin); and updated fracturing and drilling regulations in Arkansas (see Rule B-19), Montana, Wyoming (click on the plus symbol next to "Chapter 3: Operational Rules, Drilling Rules" and then "Section 45. Well Stimulation"), and Louisiana and Ohio (for urban areas). See also the Delaware River Basin Commission's proposed regulations of fracturing within the basin, Colorado's comprehensive update of its oil and gas drilling regulations, and the extensive restrictions proposed for high-volume fracturing within New York's preliminary revised Supplemental Generic Environmental Impact Statement, for which the comment period is open through December 12. States increasingly require disclosure of fracturing fluids either to state agencies or the public (or both), as summarized in a recent post, and the EPA issued a letter and subpoena to obtain chemical data for its ongoing fracturing study. 6) States' enforcement capacities and activity in the oil and gas area seem to vary. The Arkansas Public Policy Panel, for example, worries that Arkansas is inadequately inspecting and enforcing violations at hydraulically fractured wells in the Fayetteville Shale. Pennsylvania has substantially increased agency staffing numbers, and the DEP has noted a number of violations--many of which have been summarized by the Pennsylvania Land Trust. For Pennsylvania DEP reporting of Marcellus enforcement, go to this link and scroll down. A 1998 Ground Water Protection Council survey describes state agency responses to complaints about alleged contamination from fracturing. 7) Much of the media attention has focused on the injection of water and chemicals underground for fracturing and potential impacts on aquifers and water wells. Indeed, there are potential gas migration concerns associated with old and new wells, as suggested by a Pennsylvania DEP draft report on stray gas migration and a recent Duke study. The activities at the surface may be more important, though--from trucking chemicals to the site (are hazardous transportation regulations adequate?) to mixing them with water on site (are spill prevention and control plans adequate? ), preventing blowouts during drilling and fracturing (blowout prevention regulations vary by state), and storing and disposing of flowback water. Many wastewater treatment plants may not be equipped to handle large quantities of new waste--some of which is slightly radioactive. The wastewater challenges are perhaps best evidenced by Pennsylvania's recent move away from POTW disposal of flowback water. In other states, the space in underground injection control wells is filling up (see West Virginia DEP's concerns, for example), thus requiring a move toward alternative disposal methods, additional drilling and permitting of UIC wells, and an aggressive focus on flowback recycling. For a summary of recent fracturing wastewater issues in Pennsylvania, see this post. 8) Creative lawsuits have emerged. For an intriguing study of regional regulation of fracturing under proposed Delaware River Basin Commission regulations, and New York's argument that these regulations require an environmental impact statement under the National Environmental Policy Act, see this complaint. For some initial court rulings on alleged contamination from fracturing in Pennsylvania, see Fiorentino v. Cabot and Berish v. Southwestern Energy Production Company. 9) The EPA is conducting a study of the "potential impacts of hydraulic fracturing on drinking water and groundwater," with initial results projected to be available by 2012 and a final report in 2014. The Texas Commission on Environmental Quality is conducting air monitoring around fractured gas wells, as is Pennsylvania. The Shale Gas Subcommittee of the Secretary of Energy Advisory Board also has released a draft fracturing report, which includes policy recommendations, as has Pennsylvania's Marcellus Shale Advisory Commission. Finally, the State Review of Oil and Natural Gas Environmental Regulations has completed reviews of state fracturing regulation in Louisiana, Ohio, Oklahoma, and Pennsylvania. This provides only a small slice of the ever-expanding body of fracturing information. I welcome comments, corrections, and additions. Lions, Tigers, and Bears...All Gone? A recent CNN article described the plummeting population of big cats in Africa, noting that populations have dropped from 450,000 fifty years ago to as few as 20,000 today. Worldwide tiger populations have experienced similar drastic declines, with an estimated 95% drop in population over the past one hundred years - from 100,000 tigers at the turn of the 20th Century to as few as 3,200 today. Of course, scientists are similarly concerned about the implications of climate change for polar bear populations, not to mention numerous other bear populations around the world. These scenarios raise interesting questions about the significance of "charismatic megafauna" in either spurring environmental protection (cute and cuddly panda bears) or in exacerbating species decline due to the "prize value" of the animal (ivory elephant tusks, tiger meat in Asian markets). Charismatic megafauna are often described as species that people "really care about," such as pandas, whales, and bald eagles, to name a few. So what does it say about the status of global biodiversity when we continue to witness precipitous declines in populations of charismatic megafauna? Perhaps the problem is jurisdictional: lions and tigers are distributed in developing countries with far less stringent environmental protections and where the animal's economic value is far higher when it is dead rather than alive. The case of mountain lions and wolves in the U.S. lends evidence in this regard, as each (the western mountain lion, at least) is recovering in population size and regaining portions of former habitat presumably due to the (relatively recent) focus on environmental protection throughout their habitat range. But as the polar bear and a variety of other species demonstrate, economic growth and habitat fragmentation also play a key role in the decline of these species. So, if lions, tigers, and bears are charismatic megafauna that people "really care about," what happens to global resources that people hold in far less regard?